Part 1 of this series presented an overview of musculoskeletal development and pediatric bone diseases (diseases that occur after 1 month of age and before skeletal maturity), which generally have a good prognosis. 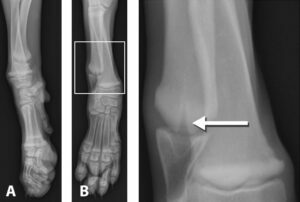 This article discusses congenital and neonatal orthopedic diseases as well as pediatric cartilage and joint diseases. Neonatal diseases are apparent at birth or within the first 3 to 4 weeks of life. While these diseases are often congenital and inherited, a direct cause for each disease has not yet been determined, and other causes, such as in utero factors, may play a role. Such diseases can be categorized according to the tissue affected. For example, dysostoses refer to diseases of individual bones or a defect in mesenchymal bone formation, whereas osteochondrodysplasia refers to defects of endochondral or intramembranous ossification.1 Part 1 of this series—Musculoskeletal Development & Pediatric Bone Diseases (May/June 2016)—presents a basic overview of the steps of ossification. Terminal hemimelia refers to a defect in which all or some of the bones distal to a certain point are missing. Intercalary hemimelia refers to a condition in which the bones proximal and distal to the missing bone or bones are present. 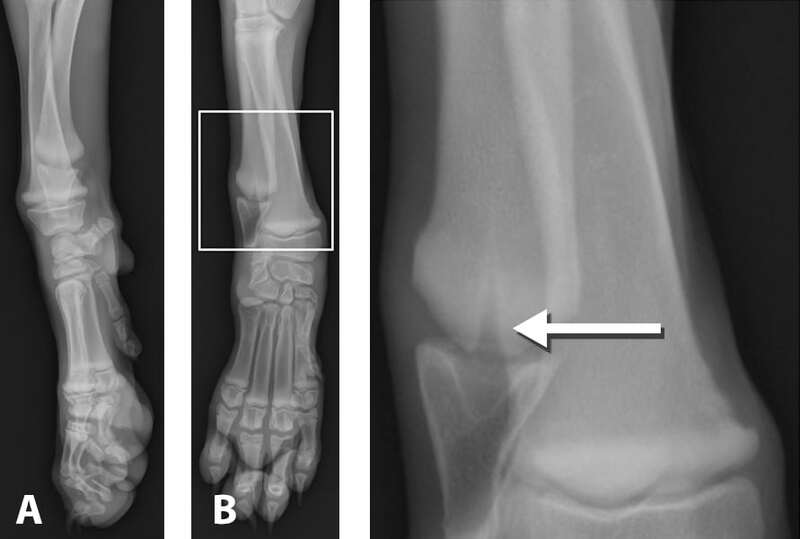 Subdivisions of both intercalary and terminal hemimelia include transverse, or complete absence of bones along the width of the limb, and longitudinal, or absence of bones along the long axis (medial or lateral) of the bone (Figures 1 and 2). Many dysostoses can be diagnosed on physical examination, but the extent of abnormality may be better characterized by orthogonal radiography. In general, most dysostoses are radiographically apparent. In the case of axial dysostoses, advanced imaging (magnetic resonance imaging [MRI]) is indicated in the presence of neurologic dysfunction to further characterize the degree and source of spinal cord compression. Treatment is generally aimed at conditions in which clinical effects degrade patient quality of life and can be divided into medical and surgical interventions. Medical intervention may include physical rehabilitation to alleviate pain, build muscle, and regain function. Splinting may be indicated when bone and limb deformities or associated soft tissue laxities or contractures are present, as can be seen with ectrodactyly or hemimelia. Other medical therapies are generally aimed at alleviation of clinical signs and may include pain-modulating medications and nonsteroidal anti-inflammatory drugs (NSAIDs). The objectives of surgery can either be palliative or reconstructive: Palliative surgery includes total or partial amputation of severely deranged limbs or digits that interfere with ambulation or are a source of discomfort due to misuse or self-mutilation. Reconstruction is aimed at limb salvage through realignment and, frequently, arthrodesis. These surgeries include amputation, arthrodesis, or reconstruction, when possible. Neutering is advised in conditions with known inheritance. 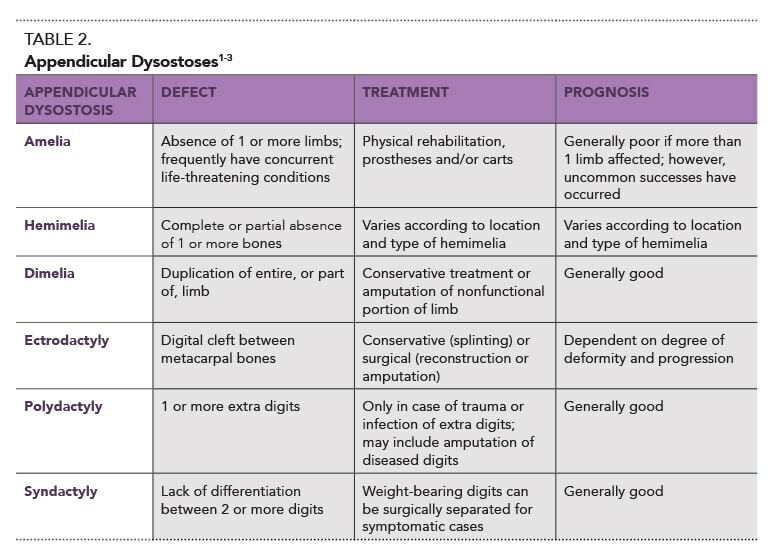 The prognosis for axial dysostoses is highly variable and depends on the degree of malformation, amount of neurologic compression, and degree and progression of secondary changes to both bone and soft tissue. 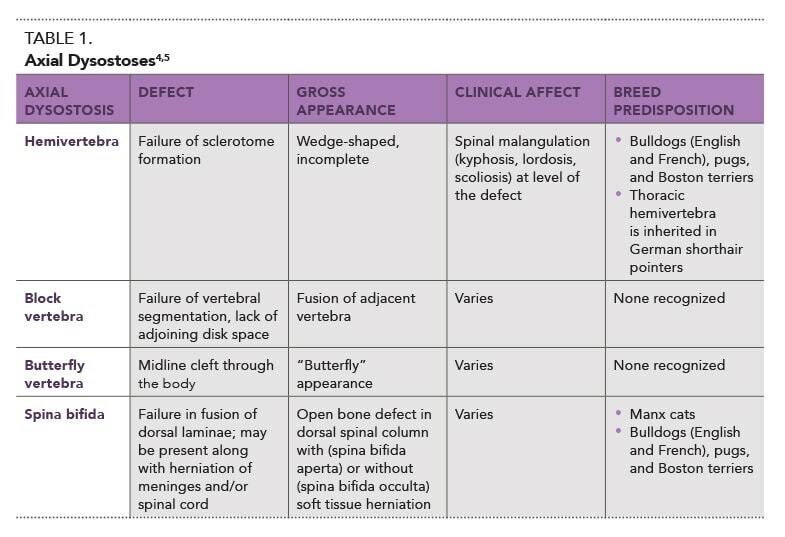 See Table 2 for appendicular cases. 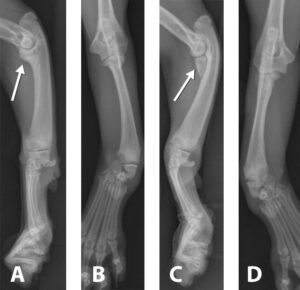 Interestingly, some forms of osteochondrodysplasia can be intentional, which occurs with selective breeding of certain breeds to create a specific phenotypic appearance (eg, miniature dachshund). Strictly speaking, dwarfism refers to the condition by which unintentional defects occur. 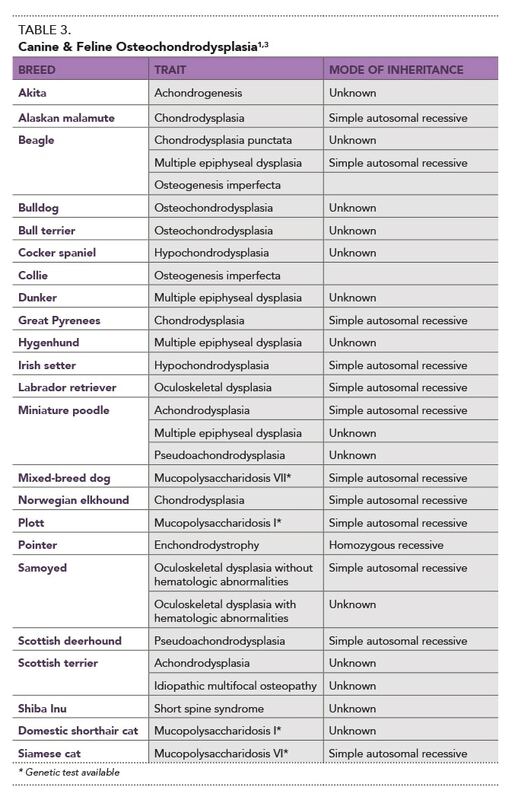 Numerous breeds have been reported with this condition; several are listed in Table 3. 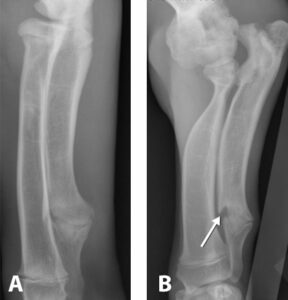 History (including familial) and physical examination (identifying concurrent congenital defects) in conjunction with radiography are generally sufficient for diagnosis of osteochondrodysplasia. Insulin-like growth factor-1 serum concentrations. Treatment is generally aimed at ameliorating clinical signs. As in other conditions discussed in this article, the heritable nature of this condition warrants neutering the affected animals or known carriers. Prognosis varies according to the type and severity of osteochondrodysplasia. Animals with thoracic limb involvement commonly have concurrent thoracic abnormalities, including pectus excavatum, sterna concave, or dorsoventral flattening of the chest.3,7,8 These concurrent abnormalities can lead to respiratory compromise. Extreme care must be exercised when bandages and/or splints are placed on growing animals because these devices must be changed frequently to avoid complications. Owners must also be properly educated on the care of such devices, with instructions to monitor for soiling, movement/slipping, swelling, or exposed digits. For animals with pectus excavatum, surgical correction of the deformity is recommended, if they have respiratory compromise or severe deformity.3,7,8 The reader is referred to the references for more specific details on the management of pectus excavatum because this is beyond the scope of this article. Osteochondrosis (OC)—also known as osteochondritis dissecans and osteochondrosis dissecans (OCD)—is a complex, multifactorial condition. Discussion of the etiopathogenesis is beyond the scope of this article; however, the interested reader is referred to Ytrehus et al9 for a thorough review. Lesions can occur in both the physis and epiphysis; however, for this discussion we will focus on OCD of the epiphysis (articular lesions). 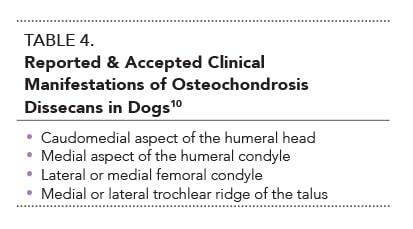 OC should be considered in any young, large-breed dog with lameness and a swollen, painful joint.10 The contralateral joint should be evaluated regardless of clinical signs because OC is most typically bilateral. 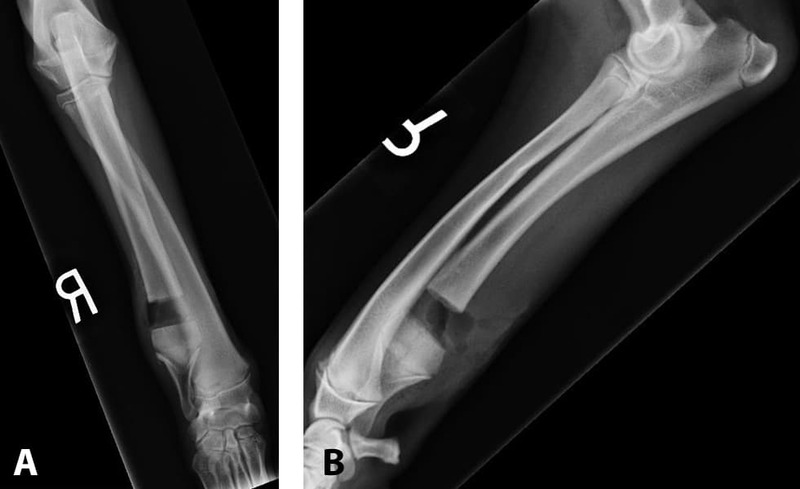 Orthogonal radiographs of the affected joint are often diagnostic. Defects in the subchondral bone, flattening of the normal contour and, in some cases, sclerotic margins are typically noted (Figures 4 to 6). Mineralization of the cartilage flap may also be noted. FIGURE 5. Lateral radiograph of the shoulder of a dog with an osteochondrosis dissecans lesion of the humeral head (arrow). FIGURE 6. 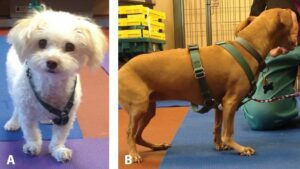 A 9-month-old, male boxer dog evaluated for left pelvic limb lameness of 3 to 4 months’ duration and diagnosed with osteochondrosis dissecans of the left stifle. 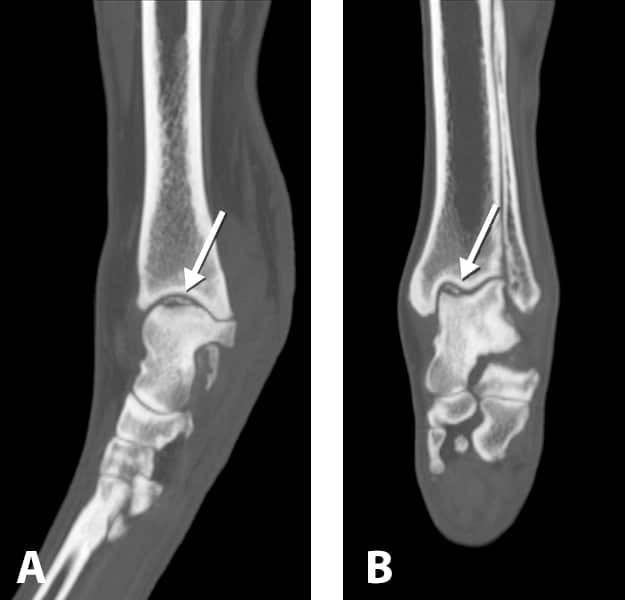 Lateral (A) and craniocaudal (B) radiographs of the left stifle; note the focal curvilinear osteolucency (arrow) within the articular surface of the lateral femoral condyle and mild osteophytosis of the lateral tibial condyle. Minimally increased intracapsular soft issue opacity is visible within the cranial aspect of the stifle joint. A positive contrast arthrogram can be helpful in identifying lesions when the cartilage flap has not mineralized. Finally, arthroscopy can be used for direct visualization of the lesion and, in some cases, allow treatment at the same time. Treatment options vary according to the joint affected and the lesion size. Medical management— maintaining a lean body condition, physical rehabilitation, regular controlled activity, and NSAIDs—is an option in most cases. Shoulder OCD is very amenable to fragment removal with curettage of subchondral bone (abrasion arthroplasty).10,13 The specific techniques and goals of abrasion arthroplasty are beyond the scope of this paper. FIGURE 7. 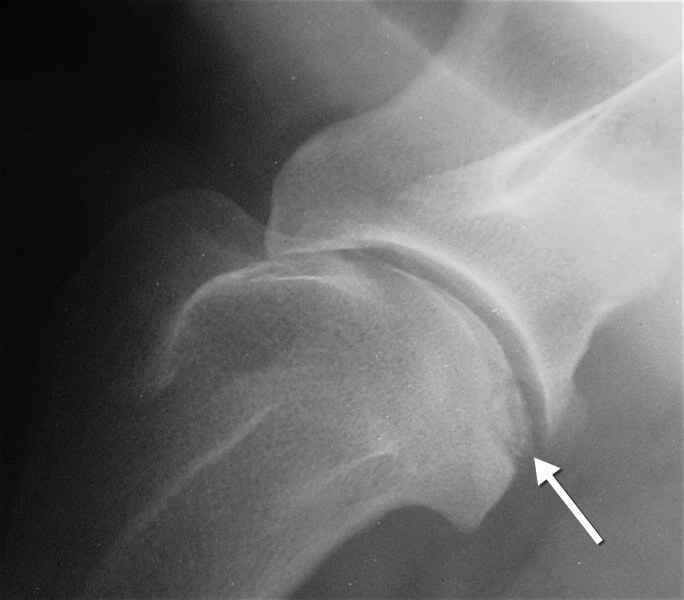 Intraoperative image of an osteochondrosis dissecans (OCD) lesion (asterisk) in the lateral femoral condyle (A). Intraoperative image in which the OCD lesion has been removed and repaired by using an Osteochondral Autograft Transfer System (OATS) graft (B, asterisk). 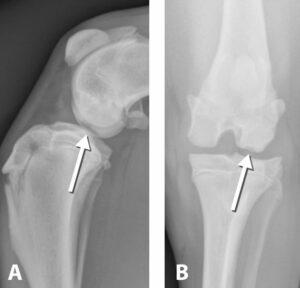 Elbow and tarsal OCD are more challenging: Treatment of elbow OCD centers on an abrasion arthroplasty of the humeral lesion.10 Tarsal OCD, in cases of small fragments, may be amenable to fragment retrieval but, in cases of larger fragments, pantarsal arthrodesis may be advocated. When contemplating the prognosis for OC, it is prudent to consider that not all joints are equal. A joint that is relatively nonconstrained, such as the shoulder, has a greater tolerance for abnormalities in cartilage pathology, whereas a more highly constrained joint, such as the tarsus, has little tolerance and, thus, a worse prognosis. In some cases, RCC causes retarded growth of the distal ulnar physis, which can result in shortening, external torsion, and procurvatum of the radius. Clinically this is observed as a torsion-angulation deformity of the distal antebrachium.3,12,16 If RCC is bilateral, so should be the resulting antebrachial deformities. FIGURE 9. Postoperative radiographs in 6-month-old, male large-breed dog that has undergone a distal ulnar physial ostectomy for treatment of retained cartilage cores and associated angular limb deformity. In all cases, owners should be questioned about the dog’s diet and environment, and a balanced diet appropriate for age and size should be prescribed. Diagnosis is usually based on clinical signs, orthopedic examination, and radiographs of suspected dogs. The orthopedic examination is characterized by carpal laxity and, in cases of carpal hyperextension, a palmograde stance (Figure 10). In cases of carpal hypoextension, the dogs stand with the carpus sitting more cranial than usual (hence the term bucked carpus). No significant pain or swelling is noted12 and radiographs are normal. The prognosis is good to excellent for most patients with mild to moderate severity. This series outlines some of the more common juvenile orthopedic diseases encountered in small animals. As noted previously in Part 1 of this series, normal musculoskeletal development is key because, as discussed in this article, deviation from normal can result in many orthopedic diseases. Patient signalment, history, and physical and orthopedic examination findings are a necessity. In many patients, appropriately positioned radiographs are required. Multiple limbs or joints may be affected, and other congenital or developmental diseases may also be present. The overall prognosis for affected dogs is generally good; however, surgery may be necessary for an optimal outcome. Although the specific cause is unknown for many of these diseases, a strong breed predilection often exists. It may be prudent to counsel owners of affected individuals against breeding. Breur GJ, McDonough SP, Todhunter RJ. The musculoskeletal system. In Peterson ME, Kutzler MA (eds): Small Animal Pediatrics: The First 12 Months of Life. St. Louis: Elsevier Saunders, 2011, pp 443-460. Towle HA, Breur GJ. Dysostoses of the canine and feline appendicular skeleton. JAVMA 2004; 225:1685-1692. Towle HA, Breur GJ. Miscellaneous orthopedic conditions. In Tobias KM, Johnston SA (eds): Veterinary Surgery: Small Animal, Vol 1. St. Louis: Elsevier Saunders, 2012, pp 1112-1126. Kerwin SC, Levine JM, Hicks DG. Thoracolumbar spine. In Tobias KM, Johnston SA (eds): Veterinary Surgery: Small Animal, Vol 1. St. Louis: Elsevier Saunders, 2012, pp 449-475. Jeffery ND, Smith PM, Talbot CE. Imaging findings and surgical treatment of hemivertebrae in three dogs. JAVMA 2007; 230:532-536. Watson ADJ, Miller AC, Allan GS, et al. Osteochondrodysplasia in bull terrier littermates. J Small Animal Pract 1991; 32:312-317. Nganvongpanit K, Yano T. Prevalence of swimming puppy syndrome in 2,443 puppies during the years 2006-2012 in Thailand. Vet Med Int 2013; 617803. Verhoeven G, de Rooster H, Risselada M, et al. Swimmer syndrome in a Devon rex kitten and an English bulldog puppy. J Small Anim Pract 2006; 47:615-619. Ytrehus B, Carlson CS, Ekman S. Etiology and pathogenesis of osteochondrosis. Vet Pathol 2007; 44:429-448. Breur GJ, Lambrechts NE. Osteochondrosis. In Tobias KM, Johnston SA (eds): Veterinary Surgery: Small Animal, Vol 1. St. Louis: Elsevier Saunders, 2012, pp 1178-1189. Ytrehus B, Grindflek E, Teige J, et al. The effect of parentage on the prevalence, severity and location of lesions of osteochondrosis in swine. J Vet Med A Physiol Pathol Clin Med 2004; 51:188-195. Fossum TW. Diseases of the joints. In Small Animal Surgery, 4th ed. St. Louis: Elsevier, 2013. Rochat MC. The shoulder. In Tobias KM, Johnston SA (eds): Veterinary Surgery: Small Animal, Vol 1. St. Louis: Elsevier Saunders, 2012, pp 692-708. Cook JL, Hudson CC, Kuroki K. Autogenous osteochondral grafting for treatment of stifle osteochondrosis in dogs. Vet Surg 2008; 37:311-321. Kowaleski MP, Boudrieau RJ, Pozzi A: Stifle joint. In Tobias KM, Johnston SA (eds): Veterinary Surgery: Small Animal, Vol 1. St. Louis: Elsevier Saunders, 2012, pp 906-998. Johnson KA. 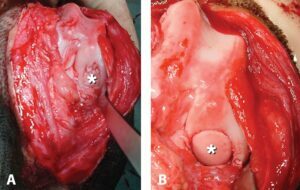 Retardation of endochondral ossification at the distal ulnar growth plate in dogs. Aust Vet J 1981; 57:474-478. 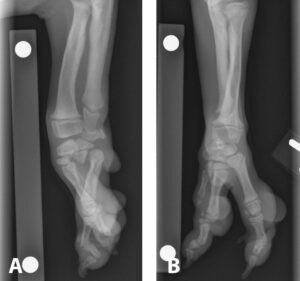 Cetinkaya MA, Yardimci C, Saglam M. Carpal laxity syndrome in forty-three puppies. Vet Comp Orthop Traumatol 2007; 20:126-130. Shannon Kerrigan, VMD, is a small animal surgery resident at the University of California–Davis. She received her VMD from, and completed a small animal rotating internship at, the University of Pennsylvania. Her areas of interest include wound healing and orthopedic biomechanical testing.